Canada’s Gabrielle Daleman performs her long program at the 2015 Thornhill Summer Skate. 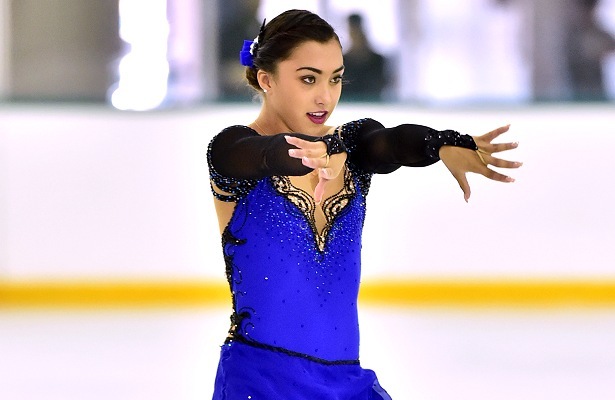 Earlier this month, Canada’s Gabrielle Daleman competed at the 23rd Ondrej Nepela Trophy where she finished fourth. The skater had mixed emotions about the event which was held in Bratislava, Slovakia. While morning practice for the free skate went well, the 17-year-old let it get away from her when it counted. The positive side is that her program component score was five points higher and the skater also achieved a new personal best overall. “I know I can do a lot better,” said the Canadian champ. Nevertheless, the skater received good feedback on her performances in Bratislava. A month earlier, Daleman was practicing her program when another skater, who was coming out of a jump, clipped her in the right knee with her blade. Daleman’s required eight stitches just under the kneecap, which was badly bruised. Fortunately, there was no damage to the tendons or muscles, and the skater attended Skate Canada’s High Performance Camp with the National Team a few days later. Last season wasn’t an easy one for Daleman. The skater from Newmarket, Ont., found herself competing with strep throat at the 2015 Canadian Tire National Skating Championships, barely winning the title by a mere 1.78 points over Alaine Chartrand. After nationals, she competed at the 2015 Four Continents Championships, where she placed seventh. Then, three weeks prior to the 2015 World Figure Skating Championships, the 17-year-old then dislocated her kneecap during practice. The 2014 Skate Canada Autumn Classic gold medalist rested and went through physiotherapy and was back on the ice the following Monday. However, she pushed her knee too hard the first day back and the injury grew worse. As a result, the skater was not allowed to jump until March 18th, a week prior to worlds. As with most skaters, her goals going into the event were to simply skate two clean programs. Unfortunately, the Daleman struggled in both programs in Shanghai, China, placing 21st overall. Despite the disappointing finish, the skater chalked it up as a learning experience in terms of listening to her body and not always try to push through what she thinks are minor aches and pains. The skater has been working with closely with her father—her off-ice trainer—and feels that she is at 90 percent compared to last season. Earlier this year, the skater sat down with her entire team to work on her plan for the season and says she is ahead of schedule. “I’m so happy with how things are going right now and I’m excited for the season!” said Daleman. Not long after worlds, Daleman went in for surgery to correct a deviated septum which was blocking 60 percent of the skater’s air flow through her nose. Daleman also made a coaching change this past spring, moving from Richmond Hill, Ont., to Toronto, Ont., to train under Lee Barkell, Brian Orser and Tracy Wilson. Over the summer, Daleman worked and improved on her jump technique, as well as basic skating and presentation skills. Lori Nichol choreographed two new programs for Daleman for the 2015-16 season. Her short program is to “(If You Can’t Sing It) You’ll Have to Swing It (Mr. Paganini),” performed by Nikki Yanofsky. Daleman is a senior in high school, but will only be taking three credits a semester in order to allow for training time. Therefore, she will not be graduating until the following year. When not studying or training, the skater likes to dance, watch movies, and spend time with family and friends. The 2014 Olympian will compete again soon at Skate Canada and Trophée Éric Bompard for her two Grand Prix events. Her goals for this season are to continue to improve and become a more consistent skater.